The Hobbyking OpenLRS receiver comes with a vertical header for the RC outputs. The problem with that is that it wont easily fit into a wing without the servo connectors sticking out. Since I also wanted FrSky telemetry emulation I figured I would have to do something about it. I put all the headers on the other side so that they fitted around the crystal. The Serial port pins are actually stand off ones whicj means I could slip another header on the I2C connecto if necessary. The trickiest part was removing the old pins. I dont ahve many soldering tools. The obvious way is to heat the bottom of the pin and push it through with the soldering iron. However DONT DO THAT since you can pop the pads off the board on the other side ( from experience!) . The best way is to grab the end of the pin on the long side as close to its end as possible with some taper nose pliers and then heat the pin near the base with a heavy soldering iron ( say 40 W). After a couple of seconds the pin will heat up, the plastic case will melt and the pin will come out easily with the pliers. This method works really nicely. Once all pins are out the plastic header casing can be pulled off easily. Now just heat each pin and and use tweezers to remove. Also cut an opening for the serial port on the TX. Reflased and configured the TX and both RXs, was all happy, closed the configurator, and... a few seconds later got a notification of a new version being posted, so started over again. Just one thing that will probably need adding is the support for different power levels for TX and RX. Haven't yet checked if the 1W module has more power levels or if it has the same but they are different, but in both cases it would be good to be able to choose different TX powers while keeping the RX at max. Where did you get the information for these mods you talk about? I just flashed the latest FW to my orange rx tx and rx modules. I would like to have the telemetry working with the LRS system in my Taranis so I assume I will have to do this inverter mod as well? Is it just an MMBT3904? Is there a thread about these mods? It's on the OpenLRSng wiki. Ok I've done the inverter mod and the rx is bound to the tx. I have proper control of the servo but on the telemetry page I still get no data. Is there something else I am supposed to do with Taranis to get the telemetry from the OpenLRS module? Here are pictures of the inverter mod. I don't think I made any mistake there. However C3 visible in the second picture was almost off the board I noticed. I don't know if I hit it on something or if it was never properly soldered from the beginning. 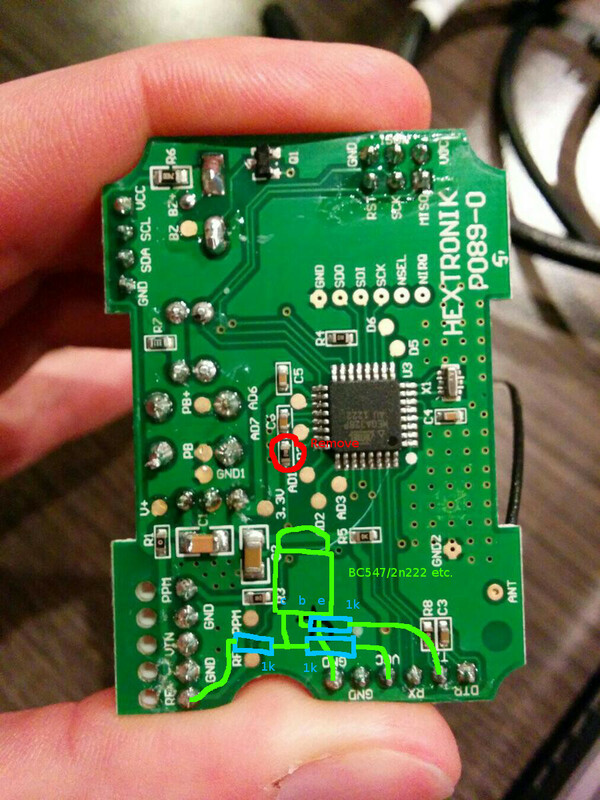 I soldered it back on but am not sure if it is making proper contact to the trace. Does anyone know its function or capacitance value? I now cannot connect to the configurator tool either and I wonder if it is related to the C3 issue as it would seem to me that the inverter mod should not prevent the FTDI basic from communicating with the Atmel chip. Any suggestions? I forgot to mention, I have ver 1.99 of the firmware in Taranis from the Mar 22 nightly build. Does it support telemetry from the external module? I opened the module again and checked with ohm meter, so C3 connects to pin 29 of the mega328 and the other side to DTR pin, so I don't think there is a bad connection there. There is nothing to do in the radio apart from making sure the internal module is off. Should be the same with 1.99. Are you sure you got the transistor pinout right? Yes looking at the flat EBC. I also tested the brand new device with a curve tracer and after all the problems and when I had the wires unsoldered I hooked the curve tracer to the leads again and confirmed that it is still an NPN device with the expected dc gain. I used the ground bus on the RF board as a convenient point to solder the emitter leg. The SMD resistors on the ends of the wires are 1k confirmed with DVM before soldering. I also looked for shorts by eye with magnifier and with the DVM. With the collector network in place and the emitter grounded I can use the config tool but when the base resistor is connected to TXD then no go. Maybe stupid question, but did you enable telemetry on the OpenLRS TX/RX, and in the correct mode? There are no stupid questions at this point! I saw that there is a frsky option and a SPORT option. I chose frsky. You need SPORT for the Taranis! Frsky's the old protocol. I knew it had to be something obvious. See, I'm the stupid one! How does Taranis work with older Rx then? Just like with the new ones, the RF module does on-the-fly conversion. Kilrah wrote: You need SPORT for the Taranis! Frsky's the old protocol. I wish there was something in the OpenLRSng docs that made that obvious in bold letters somewhere! Ok now that I have working telemetry any idea why I was getting the issues using the config tool with the inverter mod? I was wondering if this might be relating to marginal DC power. I tested this theory and it is not. I had been using USB power for flashing and configuring, which seems to be fine as long as the output power level is selected at 0 or 1. I have been using a FTDI basic from Sparkfun which has a solder jumper for 5v/3v3 so I completely removed the jumer which isolates the power pin and I can plug into the ISP header without issue and use the Taranis to power the module. I still get the "failed to enter binary mode" error on the config tool. Am I the only one having this issue? Am I again having a 'senior moment' here? I don't remember if I actually connected to the GUI since I did the mod. But never had an issue connecting when I tried.